He is survived by his loving wife of 21 years, Cate Corzatt-Decounter; brother Grover Decounter (Mary Jo); sisters, Connie Decounter, Cathy Sanzoterra, and Dixie Widner(Red); and numerous nieces and nephews. Darel was raised in Good Hope, IL. He moved to Nashville 20 years ago to pursue his career in music. He played keyboard, and was a backup vocalist for The John Anderson Band for 16 years, and played for multiple bands prior to that. Visitation will be at Cole & Garrett Funeral Home, White House Monday from 4-8 pm, and where funeral Services will be held Tuesday May 5, at 1 pm. Interment to follow at White House Memorial Gardens. 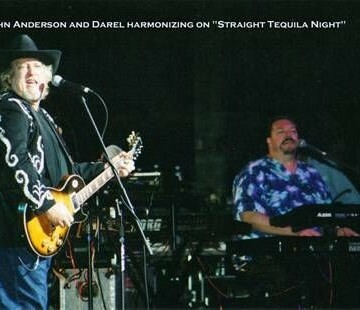 The John Anderson Band will serve as pallbearers. I had the honor of meeting the DeCounter’s when I was 19 years old. Kate helped me get my first “real” job and they were both mentors to me. The nicest people in the world and I lost touch with them over the years. I have searched for them awhile back and found an email for Darel and he responded but then I moved again and have recently been searching for them thru the internet since being back in Tennessee. I was sad that this was what I found first and had to learn of Darel’s passing two years ago. I love you Kate!! I loved you Darel! I’m sorry I didn’t keep in touch like I should have. You both will always have a special place in my heart!! I still miss my little “bro” and think of him every day. No one could ask for a kinder and more loving sibling. Mom and Dad were so proud as we all were. Immensely sorry I did not learn of this until today…12-27-10. I was trying to locate Darel to get some advice on starting something up similar to what he was doing….sort of adding percussion/drums to soloists/groups from the local area. I googled Darel and the first thing I saw was a link to his obituary. Shock doesn’t begin to describe the emotions. I remember Darel being in a constant good humor and a great talent. I have many happy memories of us practicing in that old shed in the middle of nowhere and going to gigs in Quincy…Bushnell…WIU… That old band truck.. being introduced to Tommy and John (The John Anderson Band) being treated as an equal. Thankfully and luckily, I still have a couple of tapes of The DeCounter Brothers Band and also Happy Train. When I sent him a CD of the Happy Train band, he called me up and seemed genuinely amazed and surprised to hear anything from that band. That band would have been around 1975….35 years ago!!!. I know this is more than a year and a half later…but I only found out about it today. My sincerest and heartful sympathies. I grew up in Good Hope with Darel we were only three months different in age although in different classes. I have so many good memories of Darel, I remember the day he purchased his first electric keyboard, I remember being best of buds on the CB radio and talking to all hours of the night, I remember his go kart with a chain saw engine, I remember buying Schwinn bikes at the same time, he had a Orange Crate and I bought a Apple Crate. The memories just go on and on, those were the good old times! With my living and traveling all around the world I lost track of Darel and his family. It was not until after his passing did I know that many of my favorite songs that I listened to so many times were his songs. I am so sad to hear of Darel’s passing. Although we weren’t close (he was a couple of years younger than me), I have and will always remember him as a quiet, sweet, blond-headed boy I grew up with in Good Hope. He always had a smile on his face and the time to sit and talk with you. Several of the DeCounters are stored with fond memories of my childhood. Ester taught kindergarted to my Dad and Me. I can still recall our kindergarten graduation. She also taught me piano for several years after school – for 50 cents a lession. I remember also, riding my bike to Maurice’s store on the corner uptown Good Hope to buy some candy or drool over some sort of trinket in his display cases. My Grandma Evans took me to an Eastern Star meeting a few times in what seemed like a huge room over his store. I knew Grover somewhat since he was a couple of years older then me. Memories of his long hair, his Judge, going to danIces that his band was playing at, marrying Mary Jo, a fellow classmante, are vivid in my mind. Although I wasn’t close to any of them, they each have had a longlasting impact to me – fond memories of a small town girl. After I was married, I also remember my parents cutting out an article from the Macomb Daily Journal to send me about Darel playing in some famous country singer’s band. Wow, I remember thinking he made the big time. Cate and all, my prayers are with you knowing you are still grieving, but I’m sure you have found comfort knowing that Darel is making music for our Lord in heaven. Its the little things that we miss when we lose a loved one. What seemed to be a simple phone call or conversation, suddenly becomes so important. Only with that person can you share that thought or a memory of a specific moment in both of your lives. For Darel, I know he would be touched that so many people like me have warm pleant, thoughts and memories of the life he shared with all of us. And yes, I was there when he played the end of Sweet Home Alabama to a T.
The opportunity to speak to you & get to know more about you & Darel has meant a great deal to both of us. We look forward to the day when we can finally get together. Our thoughts & prayers are always with you. Kate, We love you and we are here always. I wrote yesterday of a song Darel and I co-wrote. I was mistaken when I listed the artists that recorded that song, I was thinking of a different song. The song that Darel and I wrote was to my knowledge only recorded by Cristy Lane, Darel, and myself. I will miss you Darel. I remember Darel singing to Kate at their wedding and thinking that she had indeed found her soulmate. Through professional ups and downs, through health issues, and through separation when he was on the road, one thing remained constant: the love, respect, and true admiration each had for each other. These are the things that last, even beyond death. May God hold you in His hands and keep you safe until you are together again. Kate, we think of you and pray for your strength during this horrible time. You know we will always be there day or night. We love you and Darel. God be with you and continue to keep your faith strong. Cate, my Dad (Dean Hansen, lives down the road from Grover and Mary Jo)called me tonight to tell me about Darel. I am in shock. I just talked with him before Easter and he was so upbeat and sounded like things were moving in the right direction. I was a freshman when he was a senior. Played in band, jazz band and “swing choir” together. He was such a sweet man, so gentle and caring. He will be missed. You have been in my thoughts so often this week. I’m so sorry for your loss of Darel. I’ve imagined what he was like – and maybe sometime you can tell me all about him. I know that if you loved him, he must have been a great guy! I will continue to think of you and ask God to strengthen you in the coming days. Cate, I am so sorry to hear about this. You had such a special relationship! My thoughts & prayers are with you, and just know I am here for you. Cate, Grover, and family, so sorry to hear about Darel. Our prayers go out to you. Darel is now playing piano in God’s band. Oh Sweetie I wish I could be there to hug and comfort you. I called and Vicky answered your cell. I love you and want you to txt me or call and leave me a message on 615 738-6047. I’m so sorry for this loss. Our thoughts and prayers are with family and friends as you gather to remember and honor Darel’s life. He was a free spirit and a man of special talents. Darel heard the beat of a different drummer long before most of us knew that there was music. God bless him and all who love him. My deepest sympathies to Darel’s extended family. I was in band with Darel and always admired his talent and friendliness. He will be missed. Cate, I am so sorry to hear of your loss.You and your family are in my prayers. We are so sorry to hear of your loss. Ric went through school with Grover and was friends and a neighbor to the DeCounter family,in Good Hope. May God give the family comfort and Blessings. My condolences to Darel’s family and friends. Was deeply saddened to hear of his passing. I was a classmate at N.H.S. class of ’75. May God comfort you in this difficult time. My thoughts and prayers go out to you and your family. Kris and I are devastated and share your grief with the untimely loss of Darel. His talent will be greatly missed as Kris had played with him many times in Illinois. Our thoughts and prayers are with you and your family during this very trying time. I am so sorry to hear about your husband. I recall how your eyes always lit up when you would talk about him. I am sorry I did not get to meet him but know he had to be a very special person for you to have married him. You are in my thoughts and prayers. Cate, so sorry about your husband. You and yours are in my thoughts and prayers. Cate, my sincerest condolences and know that you and your family are in our thoughts and prayers. Darel recorded a couple demos for me over the years and just sent me an email Friday morning at | am with the most recent one he finished for me. He was always very supportive and I appreciated his friendship and musical kinship we shared. I did not have the pleasure of meeting your husband, but from the things you said about him I know that you love him deeply. Nothing I write here or say to you personally can help right now, but please know that you are loved. I pray that God will surround you and your family with His love and peace. My heart felt sympathy to you and the DeCounter family. I have very many fond memories of Darel. What a wonderful talented person and a great friend. May God comfort you in the many days ahead. I am so sorry to hear about your brother. I just heard about it today on Monday. I wanted to let you know that my thoughts and prayers are with you. Cate, you and yours, will be in my prayers this sad day. Darel, had the talent to turn a simple guitar and vocal into something anyone would be proud to say they wrote. He made many demos for me. I would have to pull each one out and count them, because, I lost track. He will be missed as a person and as a great talent. For many years I have known Darel, I worked with him in Bands before he moved to Nashville and recently opened for John Anderson in Milwaukee, WI. We are very sadened by his passing and our thoughts and prayers are with Cate and his family. He will be missed greatly. I met Darel a few years ago when I was visiting Nashville. Within seconds we struck up a friendly conversation and it felt like we had known each other for a long time. This was easy with him, because he was kind, gentle, sincere, and of course talented. Most of all, he was passionate about his work and relationships. It was truly evident Darel really cared about his clients, and it was a pleasure to be able to introduce him to a number of them who he knew, but had not met. Like the giving man he was, he sent me some gifts soon afterwards, as a gesture of his gratitude. I enjoyed my conversations and contact with Daryl, and offer my sincerest condolences to his family and close friends–which I am sure are many. Please accept my sincerest condolences. Darel was responsible for helping me realize my dreams with his work on my music. He was always very generous with his time and counsel and I will miss him dearly. We have many fond memories of Darel. As we are on a tour of Canada at the moment and can’t be there to express our sympathy in person, we want Cate and Darel’s family to know that our thoughts and prayers are with you. My prayers go out to his wonderful friends and family. You are in our prayers. Darel has a special place in our hearts. We Love You!! Our thoughts and prayers are with the DeCounter families.